There are little things I have wondered how to do and have actively tried to learn these things. Recently, a friend was showing me their tie collection. They have more ties than I have clothes. 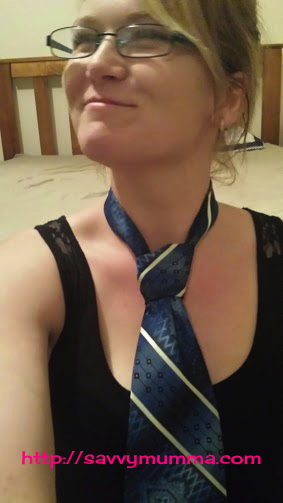 I was playing around when I said I didn't know how to tie a tie, but always wanted to know. So he offered to teach me! I have seen how to do it on pinterest but since I don't own a tie, I just never did it. I tied this tie all by myself. Not bad for a first effort! Now I want to get a tie and learn all the different ways to do it. It got me thinking, how often do we think we'd like to learn something small like this, but never actually do it? What is stopping you? Are there any little things you would like to learn or are learning?